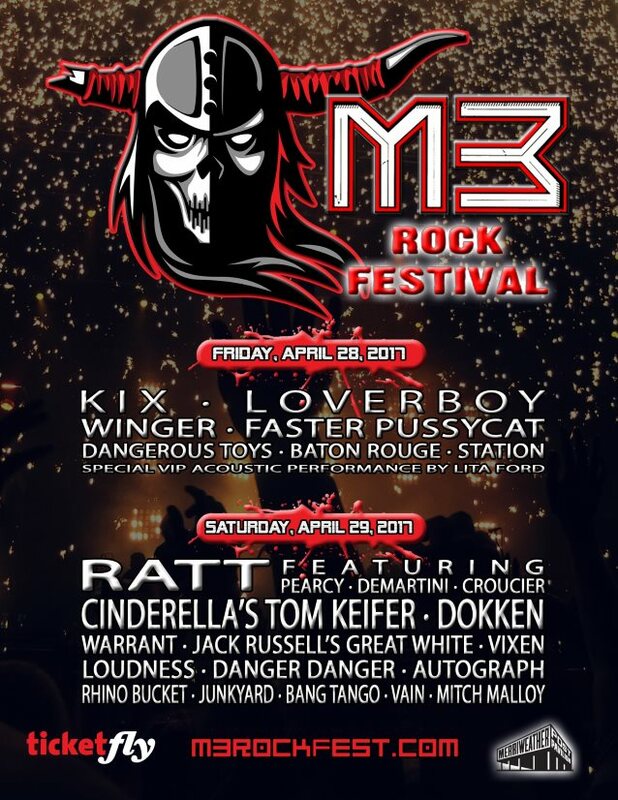 The newly reunited RATT — featuring singer Stephen Pearcy, bassist Juan Croucier and guitarist Warren DeMartini — has been confirmed to perform at next year's edition of the M3 Rock Festival, set to take place on Friday, April 28, 2017 and Saturday, April 29, 2017 at Merriweather Post Pavilion in Columbia, Maryland. 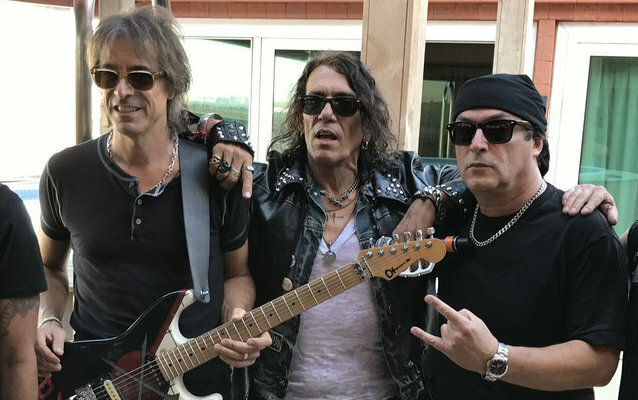 As previously reported, Pearcy, Croucier and DeMartini — took control of the RATT name after a judge ruled against drummer Bobby Blotzer with respect to whether Croucier had committed trademark infringement by using the RATT name and logo to advertise his band RATT'S JUAN CROUCIER back in the fall 2015. The judge furthermore decided (WBS, Inc. v. Juan Croucier et al., Case No. 2:15-cv-07251-DDP) that the corporation WBS, Inc., of which Blotzer and DeMartini were thought to be the sole shareholders, and which Blotzer has claimed owns the RATT name and brand, did not have ownership interest in the RATT marks and that the name and brand was still owned by the members who were part of the original RATT partnership agreement: Pearcy, Croucier, DeMartini and Blotzer. Under a 1985 written Ratt Partnership Agreement, the name/trademarks are the property of the partnership and can only be transferred with the unanimous approval of all partners. Thus, in 1997 when Blotzer, DeMartini and Pearcy purported to transfer the trademarks to WBS, that transfer was invalid since Croucier, who was still a partner, was never advised of, and therefore did not consent to, the transfer. Thus, the partnership still owns the RATT name. Pearcy, DeMartini and Croucier have now expelled Blotzer from the partnership, according to a press release issued by the trio. Blotzer thus has no further interest in the RATT name and may now only refer to himself as a "former member of RATT," as per the partnership agreement. Pearcy, Croucier and DeMartini last performed together as the "surprise band" on October 1 on the Monsters Of Rock Cruise West, also known as Monsterwood. Joining them on stage at the event were former QUIET RIOT guitarist Carlos Cavazo, who played on RATT's last studio album, 2010's "Infestation", and drummer Jimmy DeGrasso, who previously played with Y&T, WHITE LION and MEGADETH, among others. Blotzer has been touring the U.S. for the last year with his own version of RATT, featuring a rotating cast of musicians, including vocalist Josh Alan (ex-SIN CITY SINNERS). DeMartini filed a lawsuit against Blotzer last year, claiming that the drummer was falsely advertising his "tribute band" as the real thing. Speculation about Pearcy, Croucier and DeMartini forming their own version of RATT to rival Blotzer's gained traction in August after they were photographed hanging out together at a Los Angeles birthday party. Bobby later dismissed the idea, telling radio personality Eddie Trunk in an interview: "Well, it's absurd. It ain't gonna happen. Warren can't do that. If Warren was to join up in that thing, he would be in competition with his own band and corporation — RATT, WBS… RATT. He would be kicked out on his rear end so quick… They'd have to call it something else; they couldn't call it anything but something else."